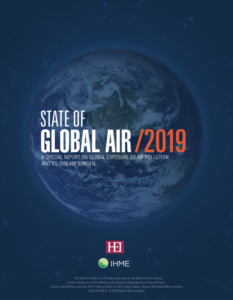 A new State of Global Air/2019 report estimates that average life expectancy worldwide is reduced by about a year and eight months due to exposure to current levels of global air pollution. If, on the other hand, all countries in the world met WHO’s air quality guidelines on control of particulate matter, the average global lifespan would increase by just seven months, according to a new report published by the Seattle-based Institute for Health Metrics and Evaluation (IHME) and the Boston-based Health Effects Institute. The findings in the report are based on research published in Environmental Science & Technology Letters in August 2018 by University of Texas at Austin’s Professor Joshua Apte. Apte’s work found that air pollution is nearly as deadly as tobacco, which reduces average annual life expectancy by one year and ten months. However, the impacts of tobacco smoking accrue mostly to people who choose to smoke or people exposed to second-hand smoke, while the health impacts of air pollution are distributed much more widely. Developing countries are hit the hardest in terms of life expectancy. The report estimates that people in many African, Eastern European, and Asian countries lose between one and 1.87 years off their life expectancy. 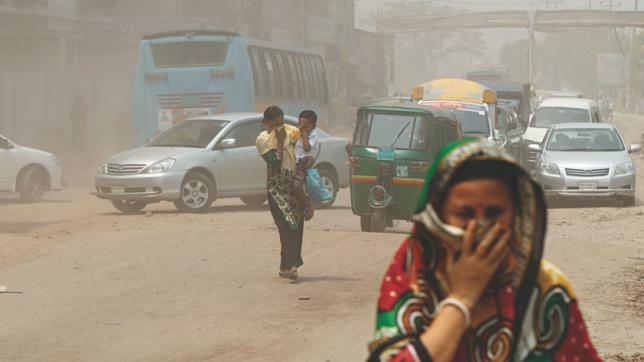 According to the new life expectancy data, India, Egypt, and Bangladesh are among the most heavily-affected countries, losing an average of a year and a half to air pollution-related health risks. China follows with an average loss of 15 months, and close after is Turkey at 10 months. Brazil, Canada, and Sweden are among the least affected, losing between two and six months off the average life expectancy. Higher-income countries are not free from risks, either. Average loss of life amongst most high-income country populations peaks at half a year, with a disproportionate health effect on the elderly. Globally, exposure to air pollution not only increases the probability of death above age 60, according to the report, but is also a major contributor to serious noncommunicable diseases such as lung cancer and heart disease. While the report also estimates that 7 months of average global life expectancy could be saved by meeting WHO Air Quality Guidelines, those WHO recommended levels are not regarded as absolute markers of pure air. In fact, WHO research has concluded that health impacts of air pollution can be experienced even at lower air pollution levels, below those recommended in the WHO guidelines. So, if the global community found a way to improve air quality above and beyond the standards the WHO has set, the health benefits could be even greater. Some seven million people die each year due to exposure to outdoor and household air pollutants, according to the WHO. While a majority of these deaths affect middle- and low-income countries, a 2016 report by the WHO showed that 91 percent of the world’s population lives in areas which do not meet WHO air quality guidelines. Though air pollution does not pose an equal threat to health everywhere in the world, this report’s findings make its risk clear. Air pollution results in damage to human life at similar rates to tobacco smoking, dietary risks, and “other high priority risk factors and diseases”, according to Apte’s research, and should be considered an immediate issue by the entire global community. Image Credits: IHME, IHME/HEI, Rashed Shumon.